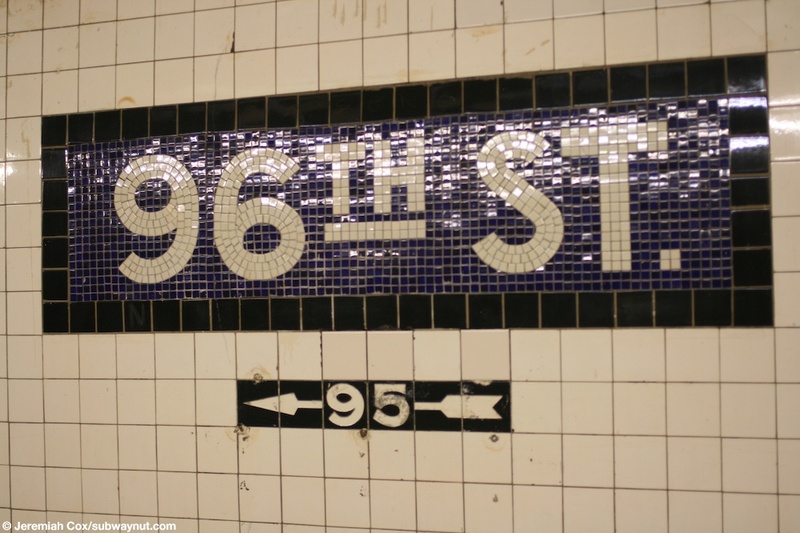 96th Street is a simple stacked IND Central Park West Line Stop. 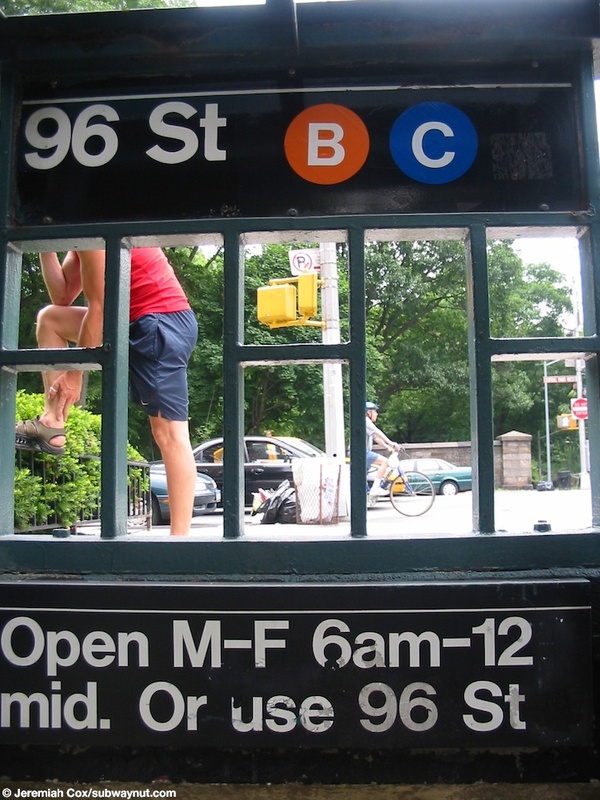 The two side platforms have the typical layout of all the local stops on Central Park West. 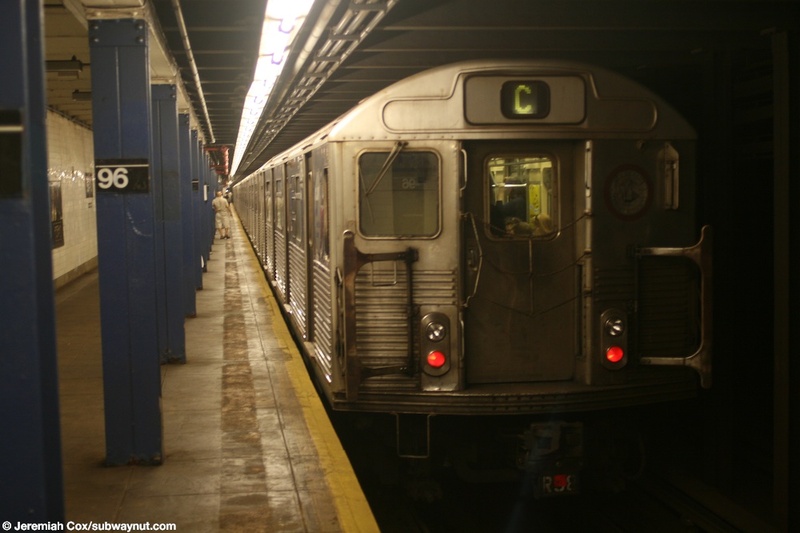 The Uptown trains are on the upper level, the downtown ones on the lower. 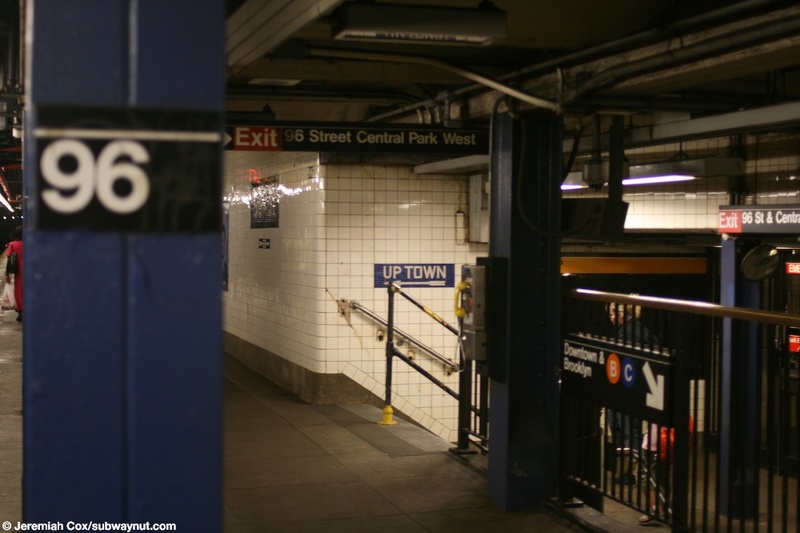 All fare control areas are directly along the uptown platform, with staircases only to the west (non-park side) of Central Park West. 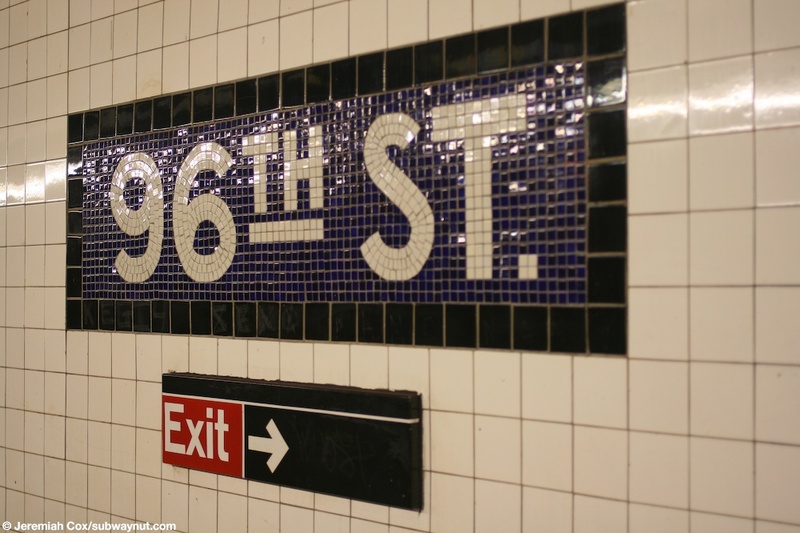 The name tablets are Blue with a black border and "96" tiling almost forming the stations trim although no trim tiling is present. 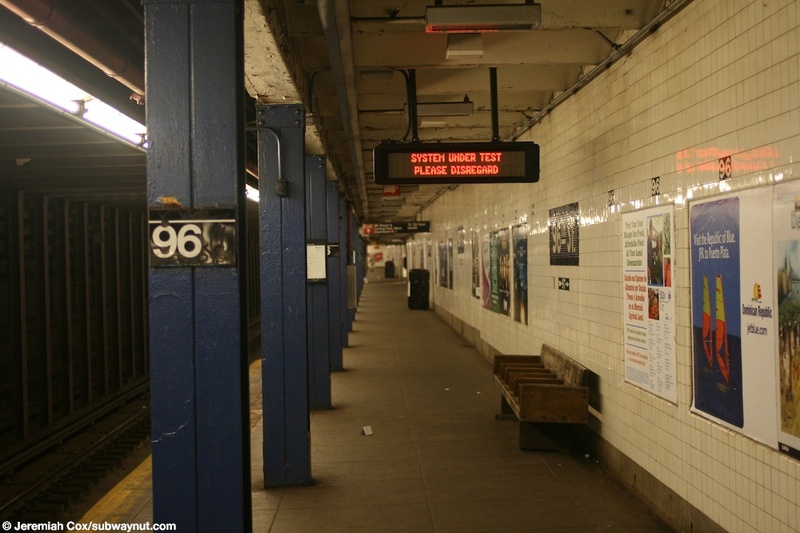 The station has two exits currently in operation, one is at the extreme northern end of the station and is an unstaffed exit with regular and high turnstiles to a single streetstair at the NW corner 97th Street & CPW, the other is the 24 hour booth right at the middle of the platform leading to a single streetstair up to the SW corner 96th St & CPW. 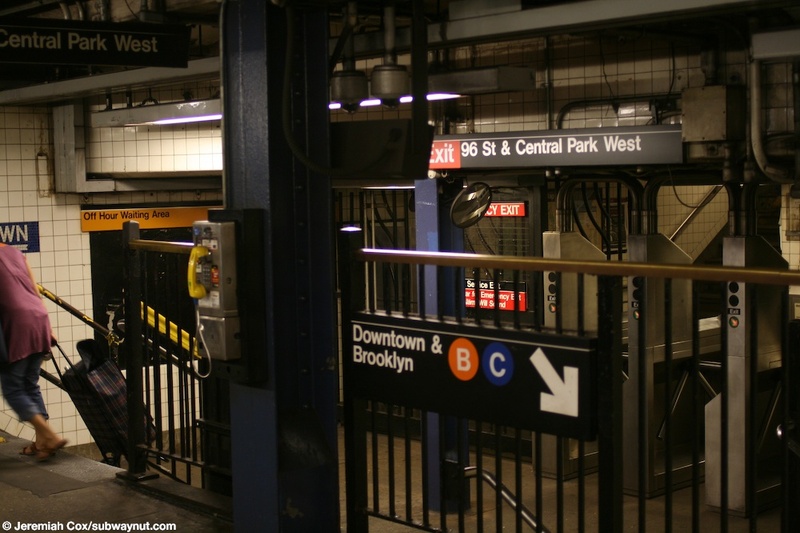 Each of the fare control areas is rather small and crampt and there is a single staircase at each down to the downtown platform. There was at some point an exit to 95 Street that has now been completely closed but some arrows beneath name tablets still point to it. 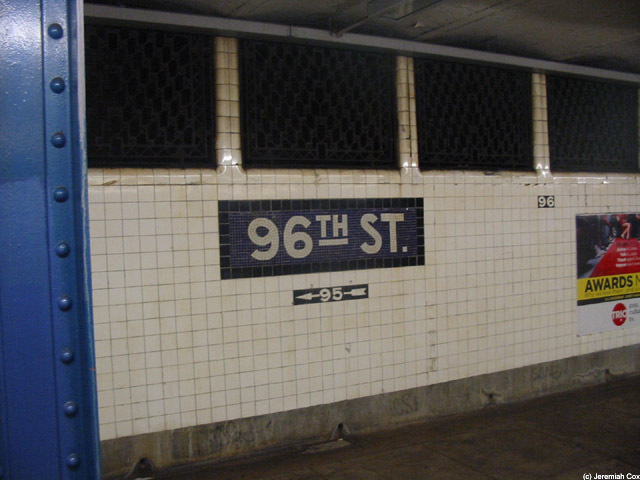 A name tablet at 96 Street with a 95 exit arrow beneath it for an exit that doesn't exist. 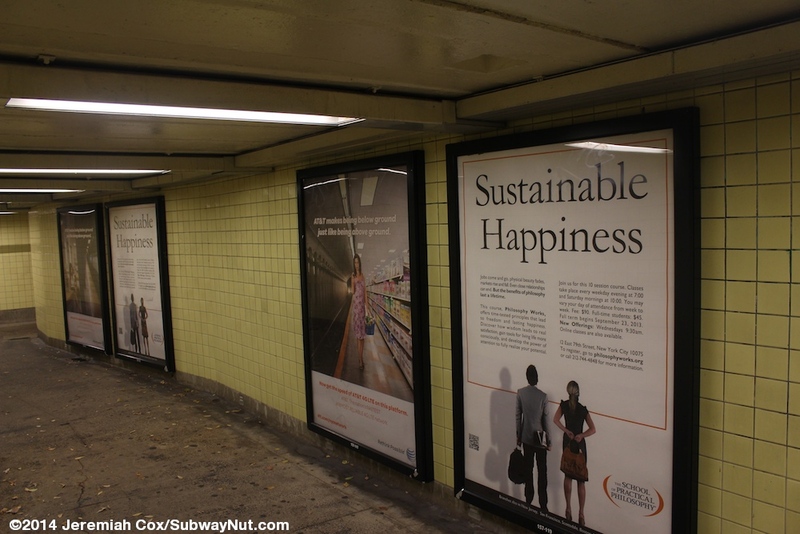 Another view out and down the uptown platform at 95 Street. 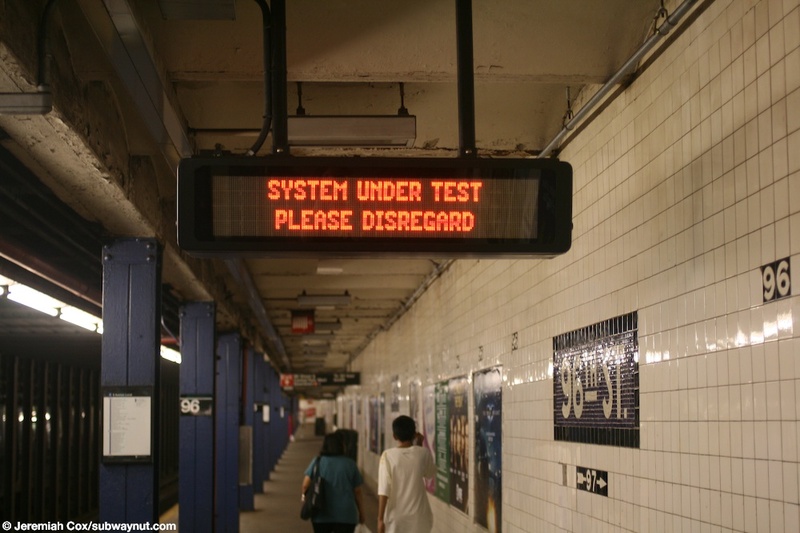 A close up of the LED sign saying System Under Test Please Ignore at 96 Street. 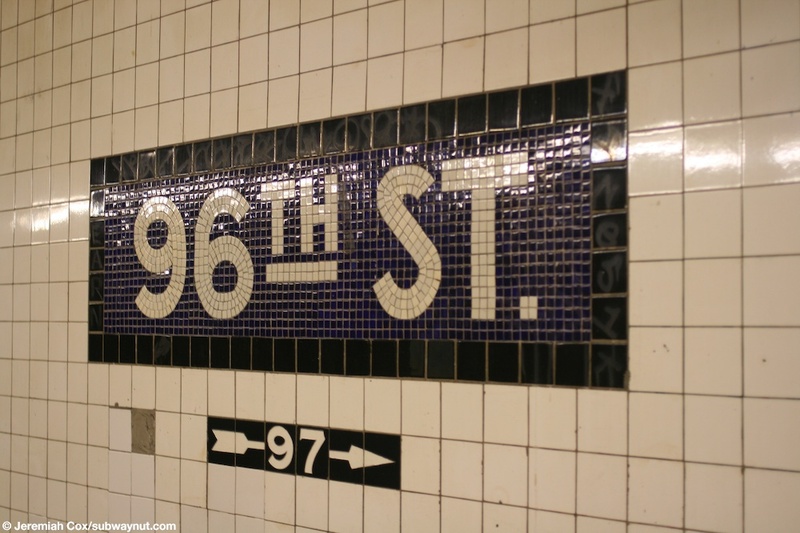 A 96th St name tablet with an arrow beneath it for the exit at 97 Street. 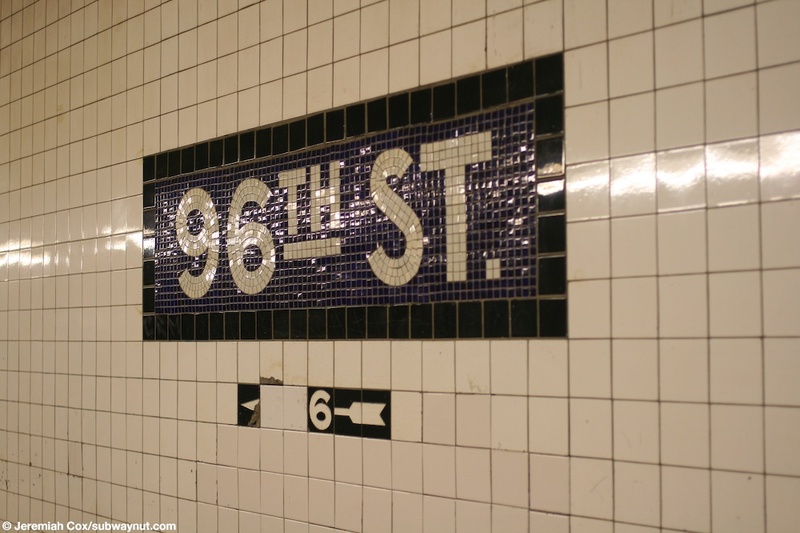 Another name tablet at 96 Street some new white tiles cover a portion of the arrow and the 9 in it beneath it. 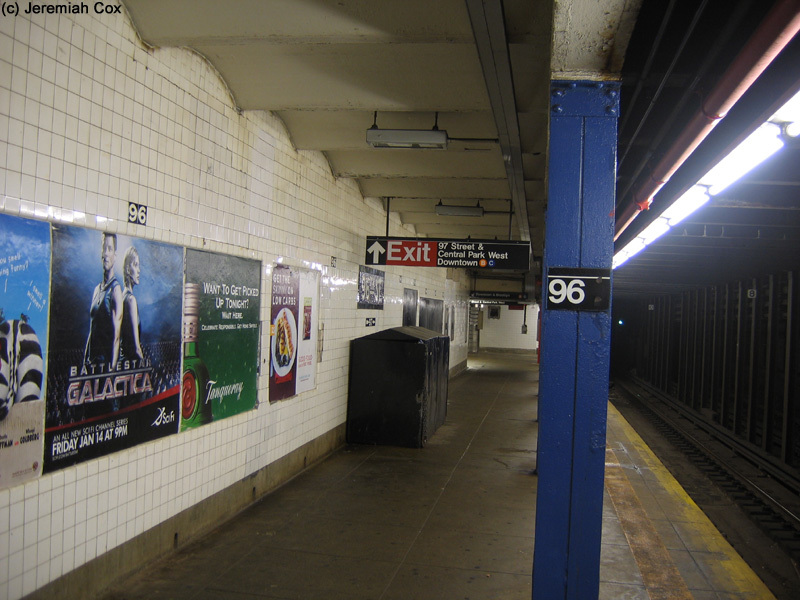 Approaching the small fare control area at 96 Street. There about four steps DOWN to this area. 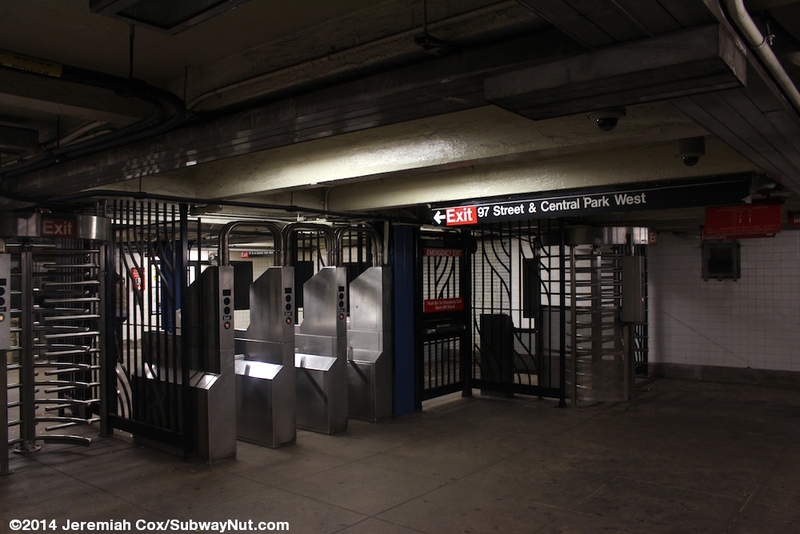 Another view of the cramped full time booth fare control area at 96 Street, it seems very small and has three turnstiles and a staircase down to the downtown platform. 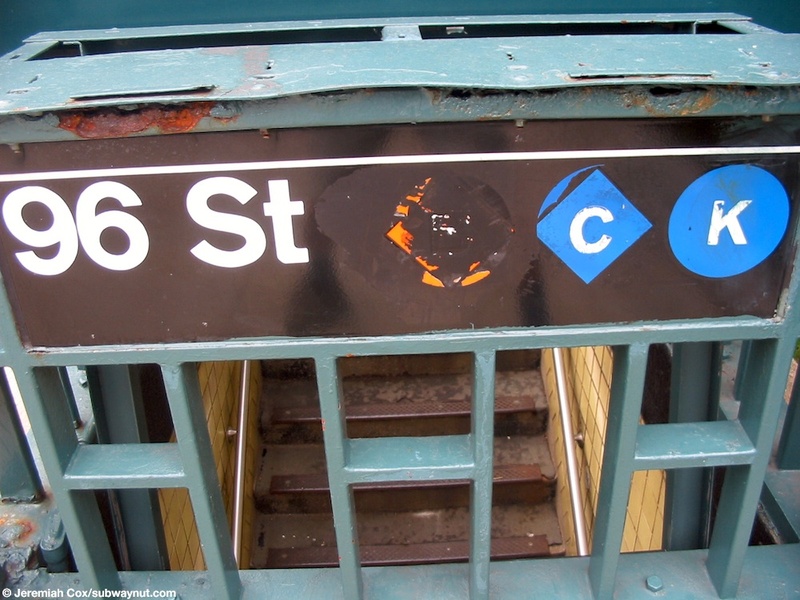 A 96 St name tablet with a new metal exit sign covering up what used to point to the closed exit at 95 St. 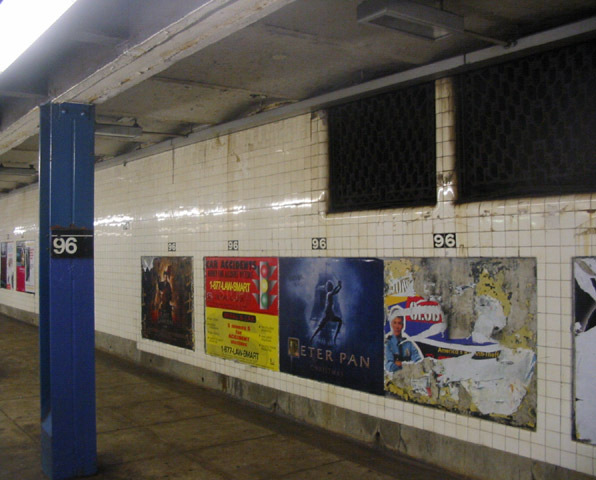 Beneath a different name tablet at 96 Street the covering has been removed revealing the arrow to the closed 95 Street exit. 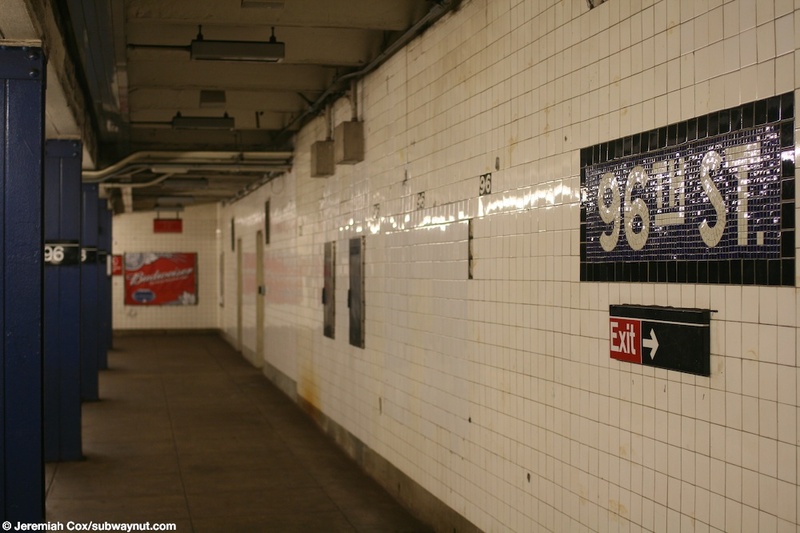 Approaching the southern end of the uptown platform at 96 Street and the tiled cover area of the old staircase down to the lower level platform and former exit to 95 Street. 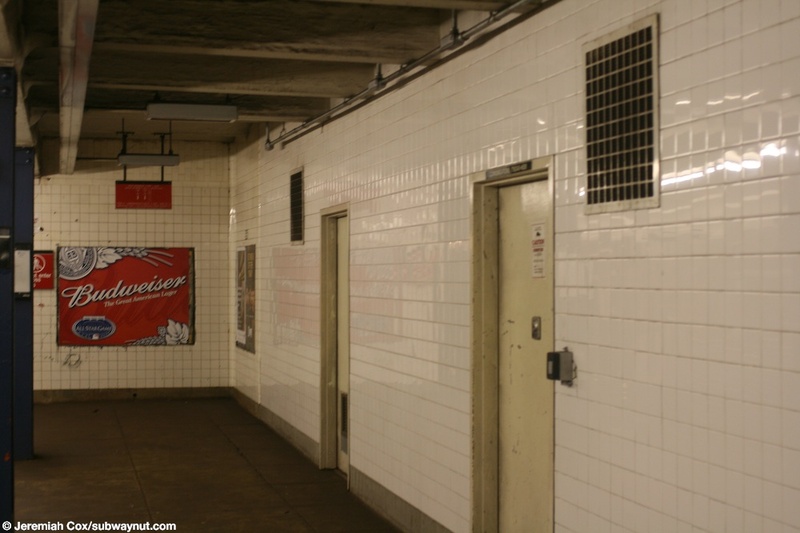 Two doors and vents in the area that used to lead to the exit at 95 Street. 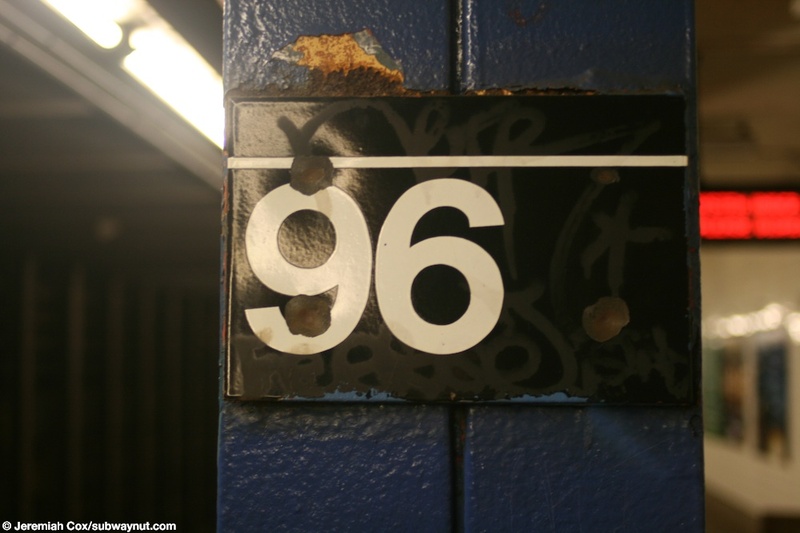 The back of a uptown R32 C train stopped at 96 Street.